Resources — An ka taa! From a linguistic perspective, the languages commonly known as Bambara, Jula or Malinké (Bamanankan, Julakan and Maninkakan respectively) are actually the Eastern varieties within a larger language-dialect continuum known as Manding that spans from Senegal to Burkina Faso in West Africa. While speakers of Manding varieties typically do not refer to it as such, the label is useful in the sense that Bambara, Jula and Malinké remain mutually intelligible and are frequently recognized by native speakers as being different varieties of but one language. The word ‘Manding’ is a Western adaptation of the word Màndén, the name of both a place and former West African polity now commonly referred to as the Mali Empire that at its apogee between the 13th and 15th centuries encompassed much of West Africa and in particular the modern day states of Guinea and Mali. Given the historical weight of the Mali empire and the spread of the Manding-speaking Muslim trade and religious network, it is of little surprise that major Manding varieties of today (i.e., Malinké in Guinea, Bambara in Mali, and Jula in Côte d’Ivoire and Burkina Faso), are widely used in their respective zones as trade languages between different peoples and language groups. 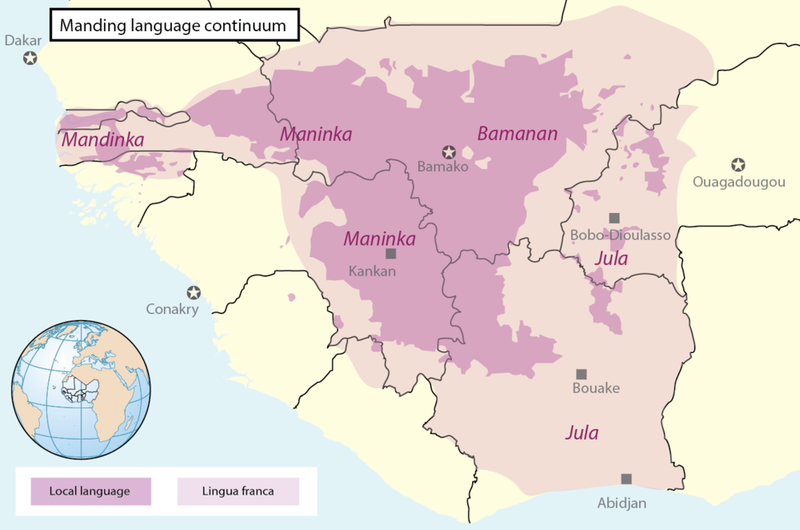 The Manding language-dialect continuum also encompasses the Western varieties frequently referred to as Mandinka or Mandingo and spoken primarily in the Gambia, Senegal, Guinea-Bissau and in smaller enclaves in Sierra Leone and Liberia. While clearly related to the Eastern varieties, they are frequently not mutually intelligible with them. Books, Articles, Apps, Audio etc. Kantè’s ߒߞߏ ߞߘߐߦߌߘߊߟߊ߲ ߥߟߊ߫ ߝߛߊ߬ߙߌ߬ߟߊ߲ ߤߊߡߌ߲߫ ߞߘߐߝߐߟߊ߲ [The N’ko Dictionary]. Kantè’s ߒߞߏ ߞߊ߲ߓߍ ߞߎ߲߬ߝߟߐ [The First Book of N’ko Grammar]. Kantè’s ߒߞߏ ߞߊ߲ߜߍ ߞߎ߲߬ߓߊߓߊ [The Big Book of N’ko Grammar].